Over 80 million researchers, academics and students across Europe and China are set to benefit from a new 10Gbps research and education (R&E) internet link, formally inaugurated at the EU-China High Level People-to-People Dialogue (HPPD) Summit held in September 2015 in Brussels. Jointly funded and operated by European R&E networking organisation GÉANT and its Chinese counterpart CERNET, the link provides long-term direct and super-fast connectivity between the two regions, enabling innovative EU-China R&E collaborations to flourish. Operational since the end of July, the circuit is contracted for a 10 year term and, with costs of less than 4 cents per user over its lifespan, represents a substantial cost saving compared to the current connectivity. 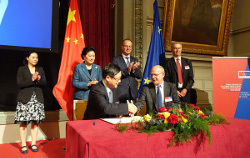 This cost-effective, long-term connectivity solution is a clear reflection of the increasingly close relationship between GÉANT and CERNET which they further underpinned by signing a Memorandum of Understanding to formalise and further strengthen ICT collaboration between the European and Chinese research and education communities. Running between Beijing and London, the circuit connects the Chinese national research and education networks (NRENs) CERNET and CSTNET to the 50 million users of the pan-European GÉANT network. It underpins a wide range of data-intensive and/or time-critical scientific collaborations between Europe and China including participation in the Large Hadron Collider (LHC) experiments, cosmic ray observation, radio-astronomy, agriculture, severe weather forecasting and life sciences projects. The high-capacity link also opens new possibilities for students and academics, supporting interactive knowledge transfer through innovative e-learning tools and stable videoconferencing, thus overcoming the complexities of multi-cultural and interdisciplinary learning.